BoyRaket.com: CELEBRATE WITH AN EARLY HOLIDAY SALE WITH ASUS ZENFONES! 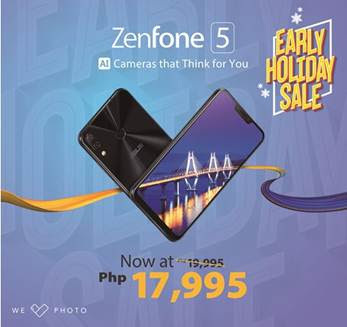 CELEBRATE WITH AN EARLY HOLIDAY SALE WITH ASUS ZENFONES! With the holiday season picking up from here on out, ZenFans can now tick off items on their Christmas lists on the eve of the highly-anticipated ber-months! On top of everyone’s wish list this season is the widely-acclaimed ZenFone 5 and its renowned AI-powered performance. The most intelligent ZenFone yet packs a 12MP + 120-degree dual rear cameras, and is powered with a Snapdragon 636 processor, all housed in a 6.2-inch All-Screen Display. Starting today, this marvel of a smartphone will officially hit the market for the bang-for-buck price of PHP 17,995.00.